Now that I’ve been baking pretty regularly, I must admit—I crave sugar. And I don’t mean the typical afternoon sugar pangs that creep up during the day while you sit stranded at your desk and you’re sick of staring at that gross bag of potato chips you’ve inevitably ravaged (you can admit it!). I mean, this constant craving to lick batter, savor chocolate bars, nibble sugar cookies and perhaps even steal a lollipop from a child (just kidding…maybe). Even just standing at the checkout counter with my batch of grapefruits or box of oatmeal becomes a battle—“Do I want that chocolate bar? That’s a silly question; of course I want that chocolate bar. But should I have it? Again, silly question. NO you really shouldn’t.” I always secretly pat myself on the back and loathe myself every time I walk out without giving in to temptation. However, I feel a little less guilty about consuming the 90-calorie hot chocolate packets housed in our office break room. And inevitably while doing research into the world of baking, I get violently hungry (It’s the Tell Tale Heart of cravings). Thus enters the hot chocolate. These Swiss Miss hot chocolate packets have saved me from either falling off the bandwagon (and then slowly plummeting down a very large ravine) or getting seriously cranky. Thank you Swiss Miss…an ode is forthcoming. And then there are just some workweeks that even these humble little hot chocolate packs can’t fix. The alarm doesn’t go off (Ugh, yes I still have a Blackberry. And yes, it is way past its prime), the train breaks down or is jam-packed (crowds don’t particularly smell too good), I spill coffee on my white shirt (or worse, my work papers. Why is EVERYTHING white? ), and I can’t seem to make a dent in the piles of papers strewn about my desk (coffee stains probably don’t help wi th that). That’s when I mentally throw in the towel and leave the stressful day at the office (or at least attempt to). I throw my purse on the kitchen floor, pour a generous glass of red wine, put on some Pink Martini (or sometimes the Vicky Cristina Barcelona soundtrack) and daydream that I’m cooking in a little kitchen in a secluded Tuscan cottage, or traipsing along the Champs-Élysées, jaunty scarf around my neck and beret on my head (because all French people do this, right?). It’s very Woody Allen-esque in my head. It gets even better if I can sneak up to the rooftop of our apartment and look out onto the cityscape. There is something soothing about city lights. I just ignore the fact that I had to pick the lock to get up there. When things get really tough and I find that the stress of the days have been building into one obscenely large anger bubble about to burst, I desperately cling to the little things that remind me A. of better times and B. that things will get better. I have such big aspirations, but when things get tough, it’s the little things that carry me through—reading in bed, an open window with a warm breeze, a perfectly steeped cup of Earl Grey, painting in sweats and comfort foods (oh right, and wine). So what inevitably cures my stress? 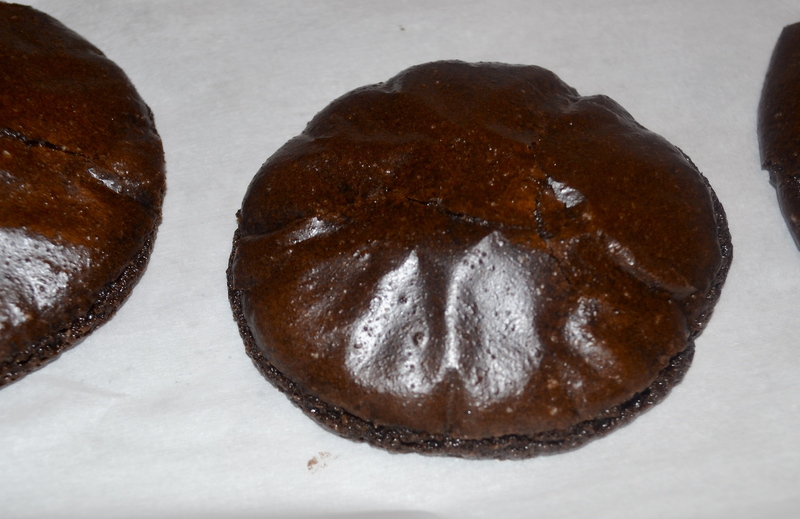 No, not whiskey (OK, maybe a little whiskey)…but chocolate! And what’s the second thing I turn to when chocolate isn’t available? Wine. So soothe your soul—and your temper—and enjoy these dark chocolate macaroons with red wine buttercream. 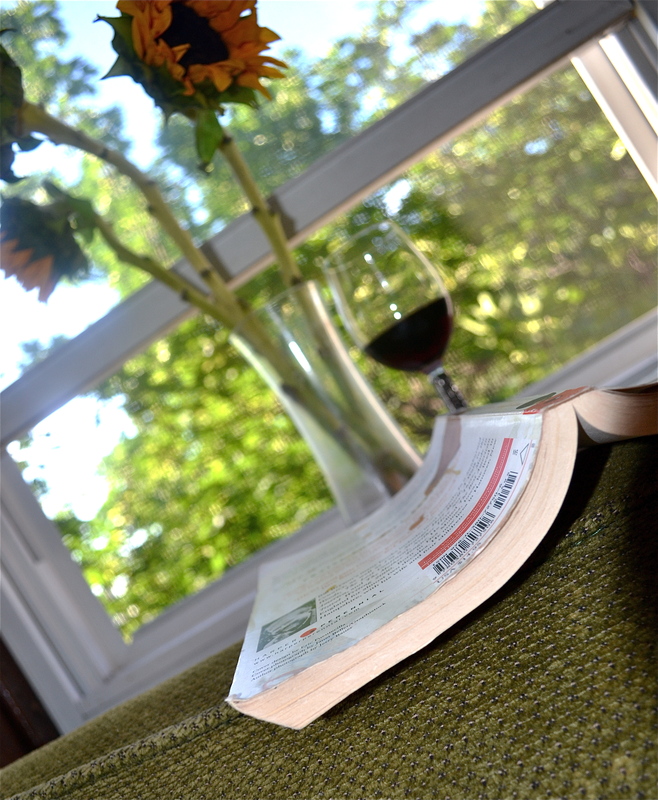 Because if chocolate and wine can’t fix ya, I don’t know what will (Cue the French music)…. 1. Preheat the oven to 350 F and put the rack in the middle. 2. 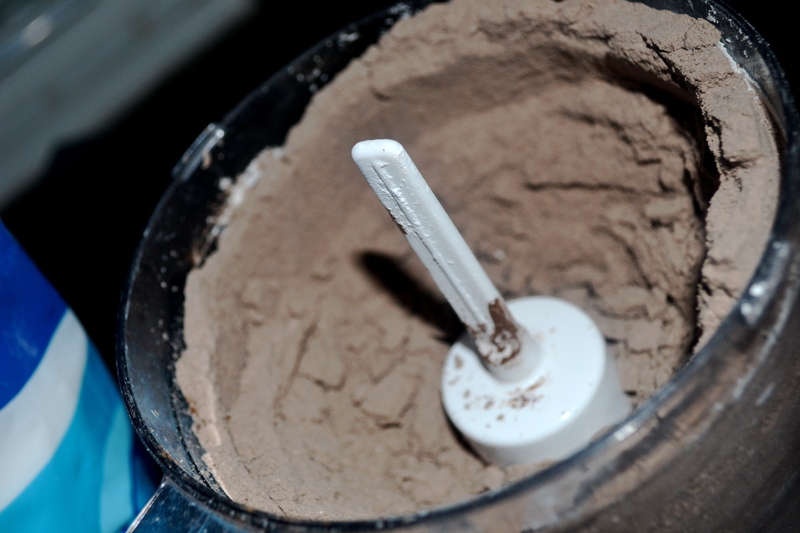 Combine the powdered sugar, almond flour, cocoa powder and salt in a food processor. Pulse until fine (about 30-45 seconds). 3. Crack the egg whites into a large bowl. Discard the yolks. 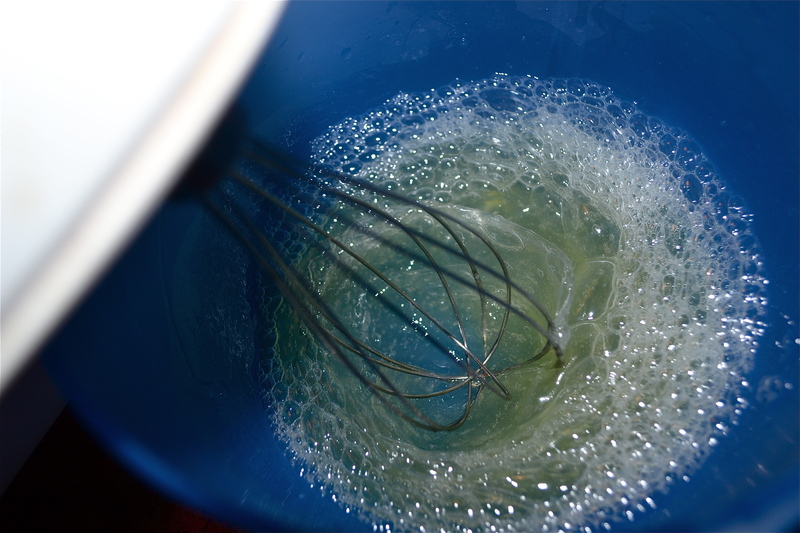 Take your mixer (stand or handheld) and whisk on medium speed until the eggs become opaque and foamy. 4. 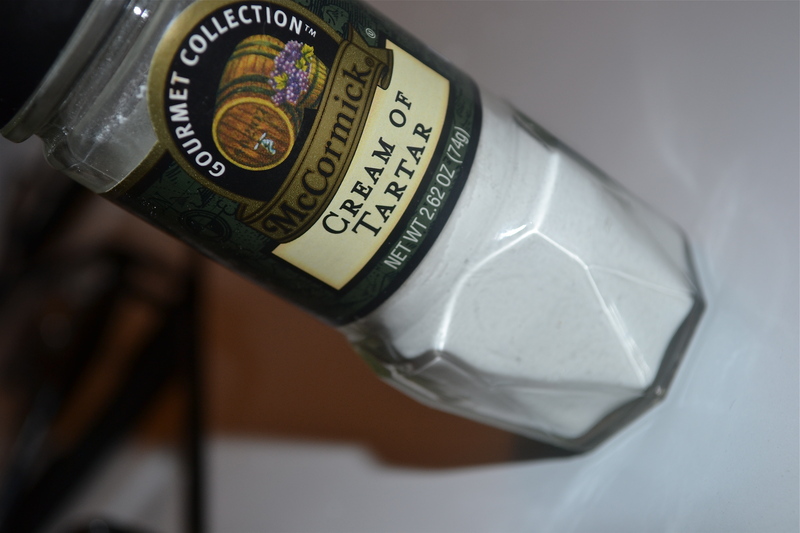 Once foamy, add the cream of tartar. 5. 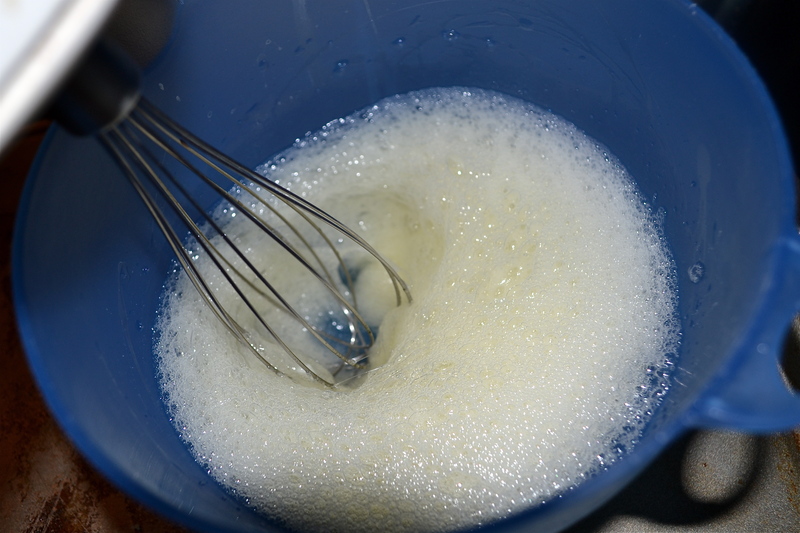 Now increase the mixer speed to high and beat until the egg whites turn white and begin to form peaks. 6. 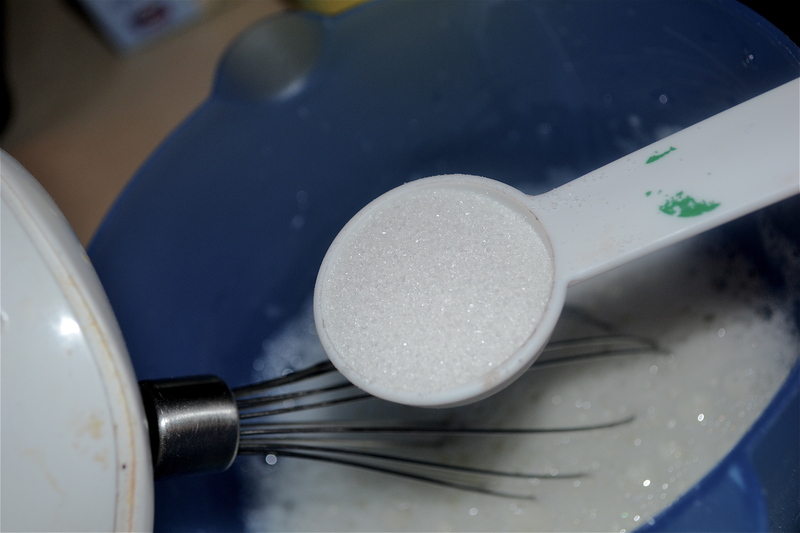 Continue to beat, but begin adding the granulated sugar. Beat until the sugar is mixed, the peaks are stiff and the mix is shiny. Remember not to over-whip. Once you notice the shiny peaks, stop mixing (usually takes about a minute). Move the mixture to a large bowl. 7. 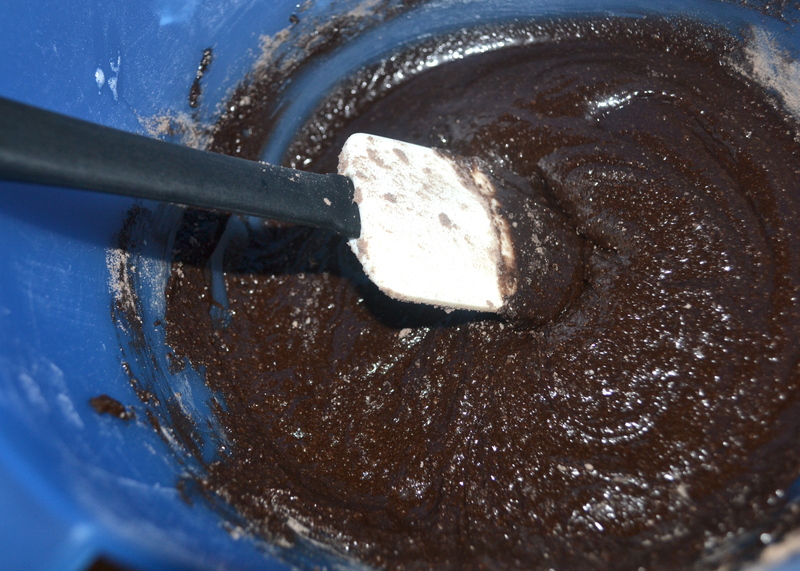 Now transfer the chocolate flour mixture into the egg whites, gently folding the flour into the eggs. 8. 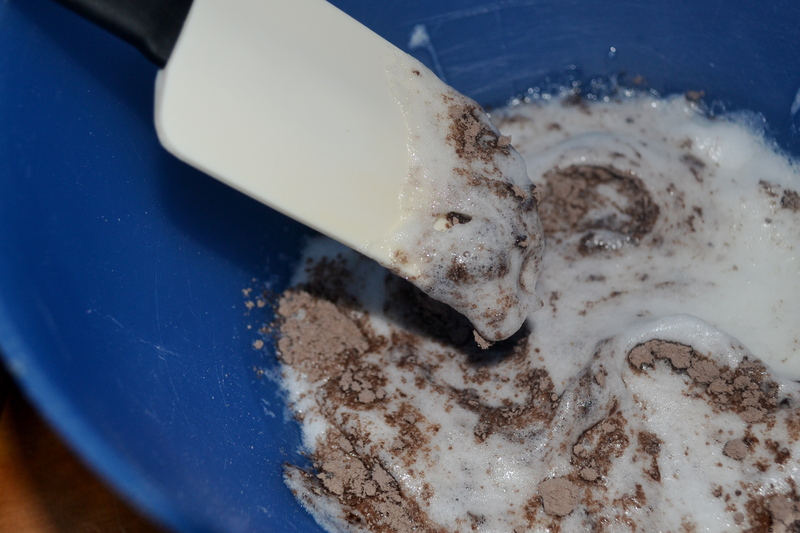 You will notice as you blend the two mixtures, that it begins to look more like thick cake batter (try not to over-mix). 9. Now it’s time to transfer the batter into a pastry bag (if you have one). I happen to have a plastic icing tool that pipes icing out, so I used this for the macaroon mixture. If you don’t have this you can always fill a large plastic baggy with the mixture and snip off a corner. 10. 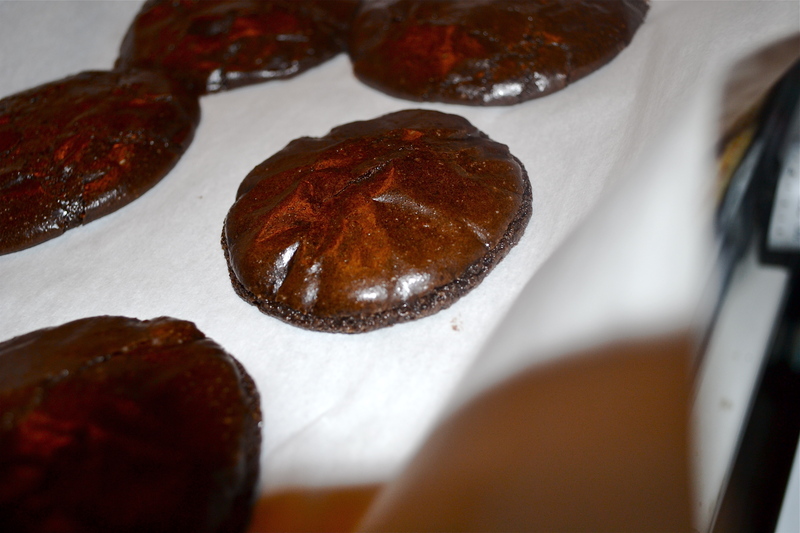 Place parchment paper down on your baking sheet and begin piping the cookies onto the sheet. Make sure the cookies are about 1 inch apart. Now pick up the baking sheets and bang against the countertop to help create the macaroon base. Then let them sit at room temperature for 30 minutes. 11. 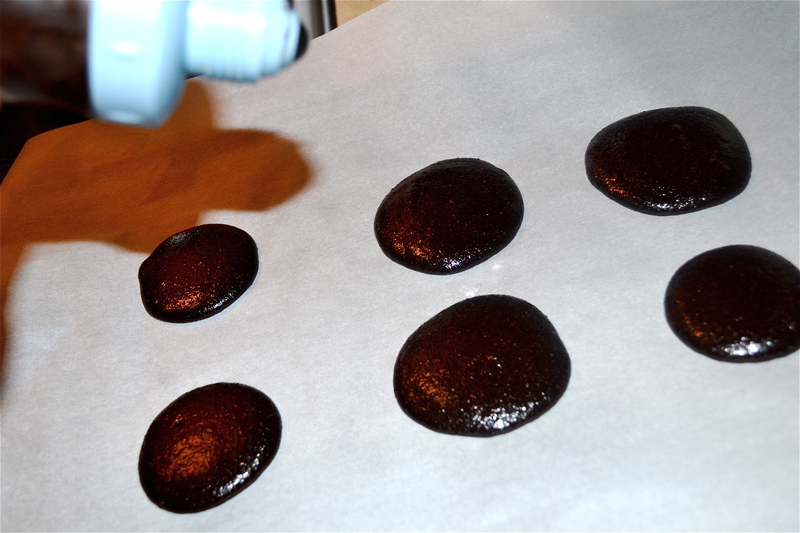 Bake the macaroons one baking sheet at a time for 7 minutes. Once the one set has cooked, remove and place on a rack to cool while transferring the other baking sheets in the oven for 7 minutes. Now for the best part…the filling. 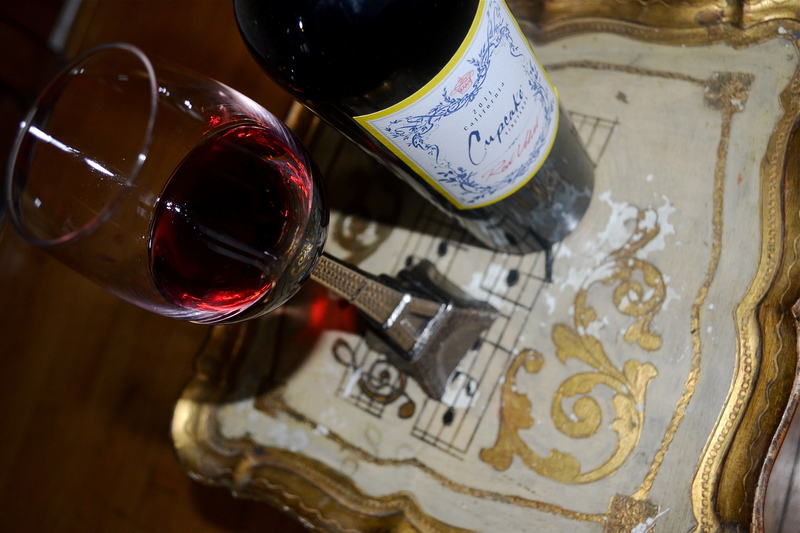 You can choose whichever wine sings to you. 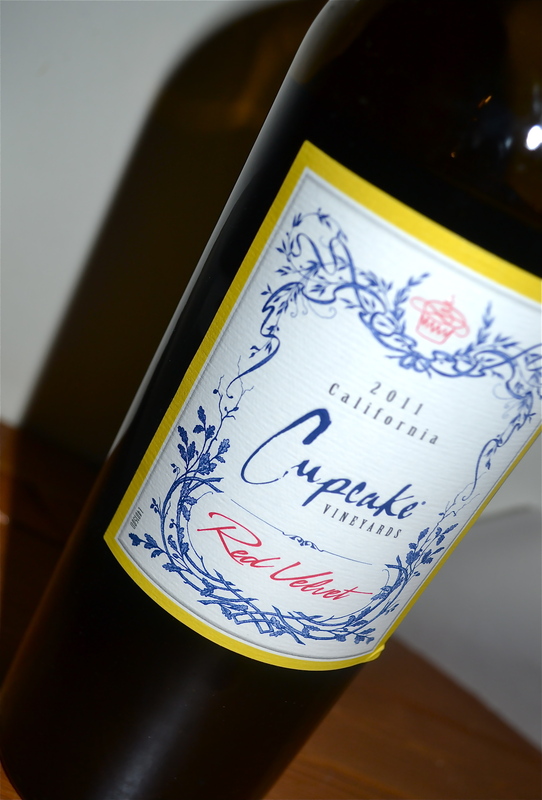 For me, I’ve always been partial to the Cupcake Vineyards Red Velvet wine. There is something sort of sweet and decadent about it and it’s been my go-to wine for calming a long workday or welcoming the glorious weekend. I also love Layer Cake Malbec. Apparently, even my wine preferences have to do with desserts. Perhaps because there is little else as amazing as wine and dessert. Also, I’m a sucker for a pretty label. Many a bad wine has been drunk due to pretty wine labels. 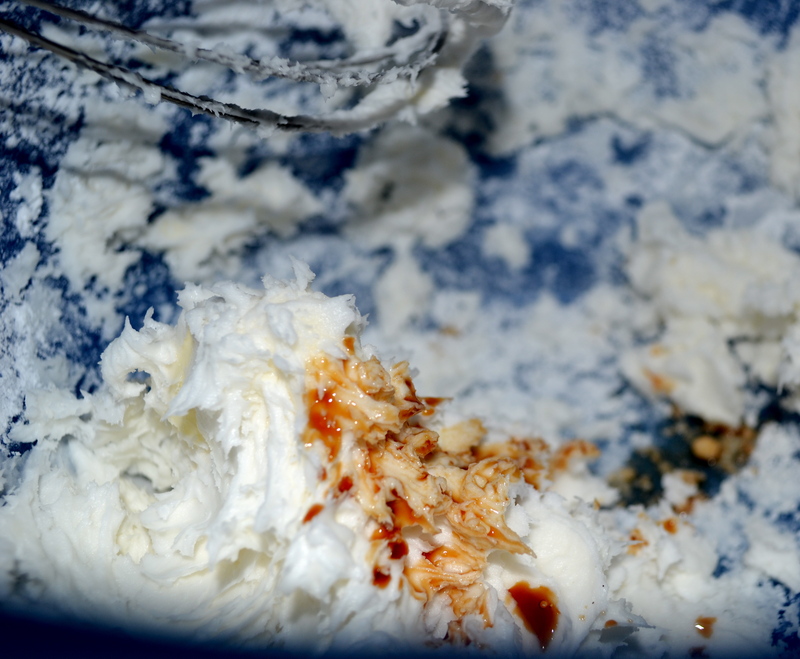 As you may remember from my Earl Grey cake story, butter and I don’t always see eye to eye (unlike Crisco). 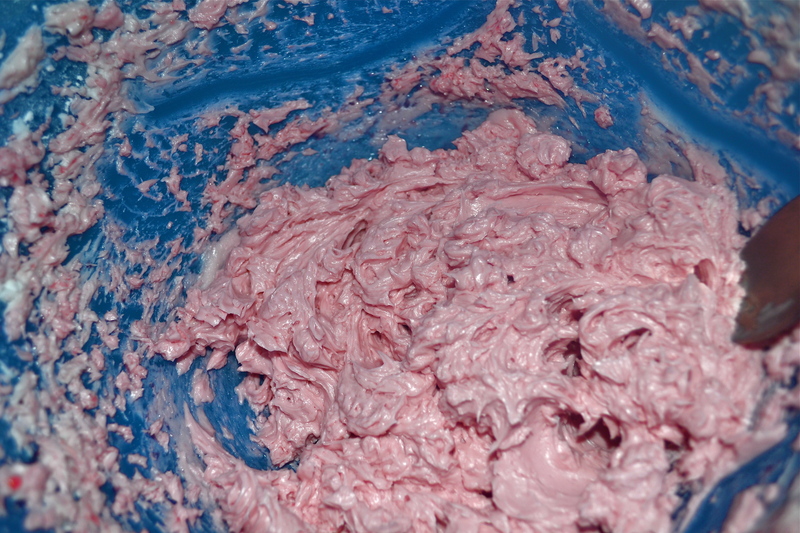 Crisco in icing always makes it fluffy, thick and pliable, and I love it. 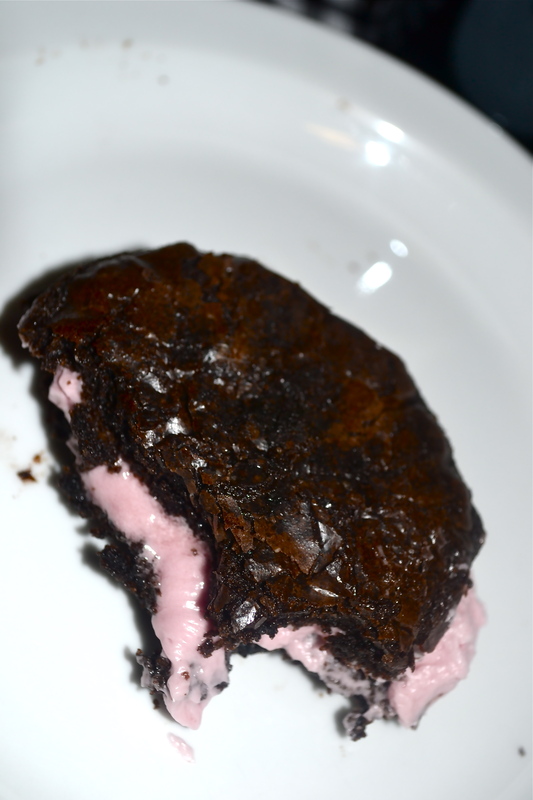 So this time I went with Crisco so I would have a sturdier cookie filling that wouldn’t drip everywhere. 1. 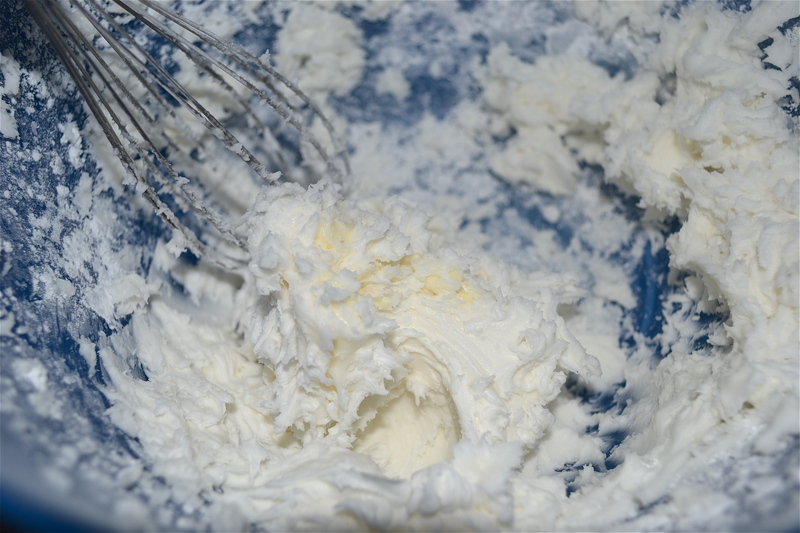 Cream together the powdered sugar and Crisco and mix on medium speed. 2. Add the vanilla extract and combine. 3. Now it’s time to add the red wine. For me, I love nothing more than playing with recipes and adding, tasting and then adding more if needed. I try to give pretty specific measurements, but sometimes it takes some kitchen chemistry to figure out how much works for you. 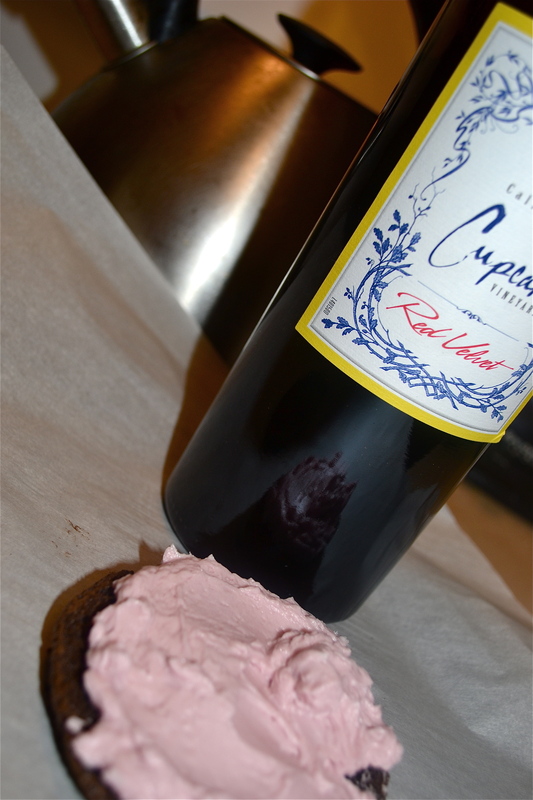 I wanted my icing to really taste like red wine (because who doesn’t?! ), so I added 3 TBSP. You may add 1 TBSP and realize you don’t need more. So what I’m ultimately recommending is to have fun and experiment (and also I’m giving you free range to taste the yummy concoction before you put it on the finished cookies! What can I say…I’m an enabler). 4. Make sure the filling is mixed well. Then I put it in the fridge while I waited for the cookies to finish baking and cooling. Now it’s time to ice the cookies! Some recommend the pastry bag but I just used a spoon and spread the filling between the two cookies. All I know is that when I took the first bite, it was as close to nirvana as I’m ever going to get (without having to contort into some painful yoga pose). Chocolate, red wine and good music…all I need now is a table outside a quaint patisserie on a peaceful little Parisian street with a good book and a bold cappuccino. But for now, I’ll settle with the lock-picked rooftop view.